There is no tired like end of year teacher tired!! Unless you are eight months pregnant like I was, then it adds a whole new edge!! 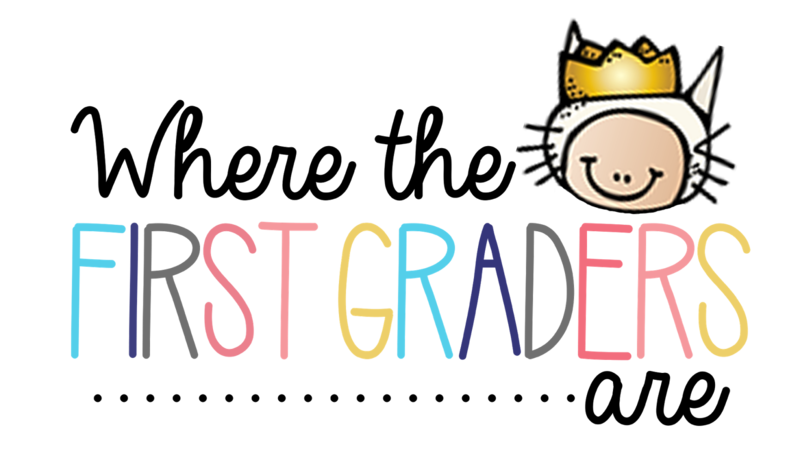 Nevertheless, the last week of school is one of my favorite weeks because our sweet little kiddos get to be just what they should be... KIDS!! 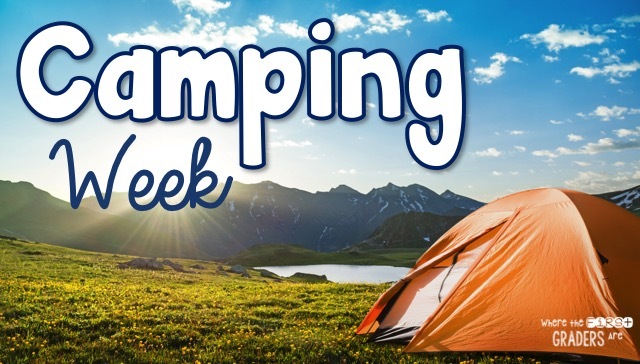 Keep reading to see how I set up a week of camp inspired activities to help my little ones gear up for summer. 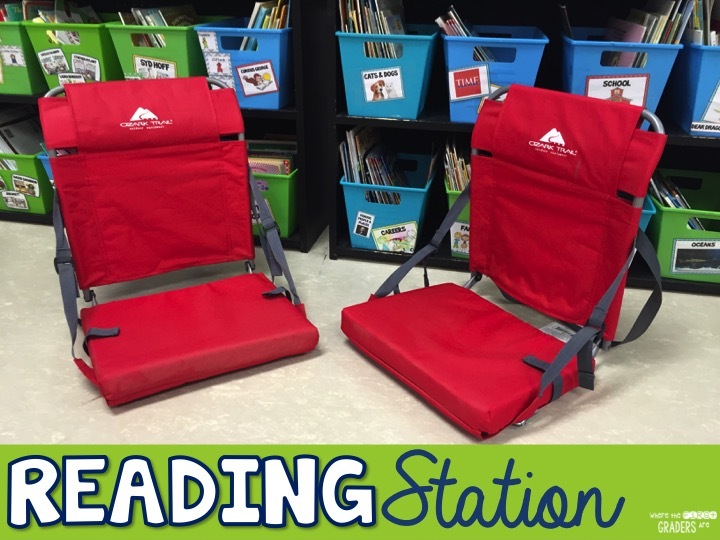 This was by far the easiest station to create! I had originally planned to set out sleeping bags for the kids to lay on, but my husband forgot to pick them up from the farm house, SO... I improvised with these stadium seats! They ended up working WAY better! The kids loved them and they were easy to set out/clean up. 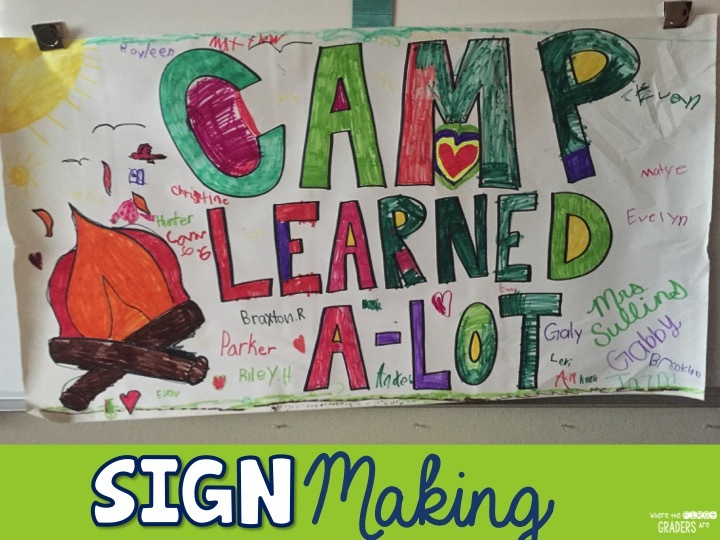 Next up, we have the sign making station. 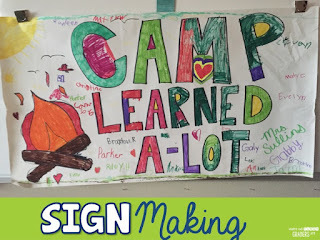 All I had to do was simply draw the letters and campfire with a black marker and sign my name as an example. The students took over the rest. It was such a great "team" building activity to wrap up the year. Parents also loved seeing it at our end of year party and it ended up serving as a backdrop for many of their pictures! 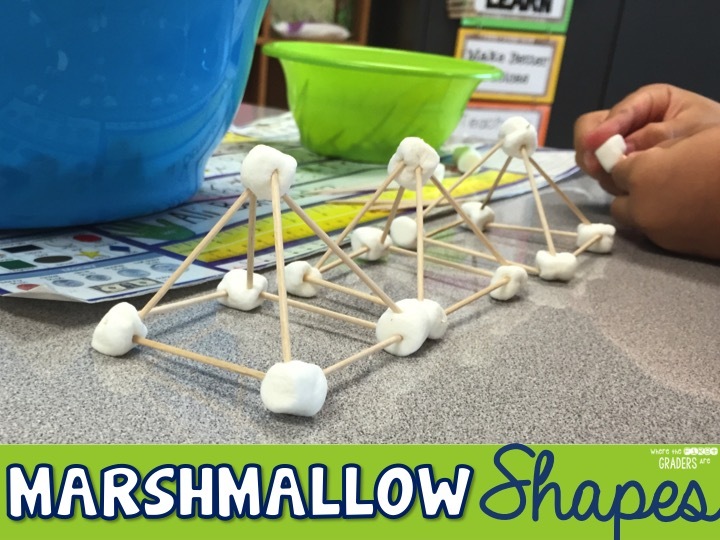 Another simple, yet super fun station activity was building 3D shapes with marshmallows and toothpicks. I bought two bags of the small marshmallows and two small boxes of toothpicks which cost me less than $4. I used one bag of marshmallows per day. A little advice, don't try to save the marshmallows for the next day, they will be way too icky!! This was an easy prep station and strangely something that most first graders have never done.. map making. 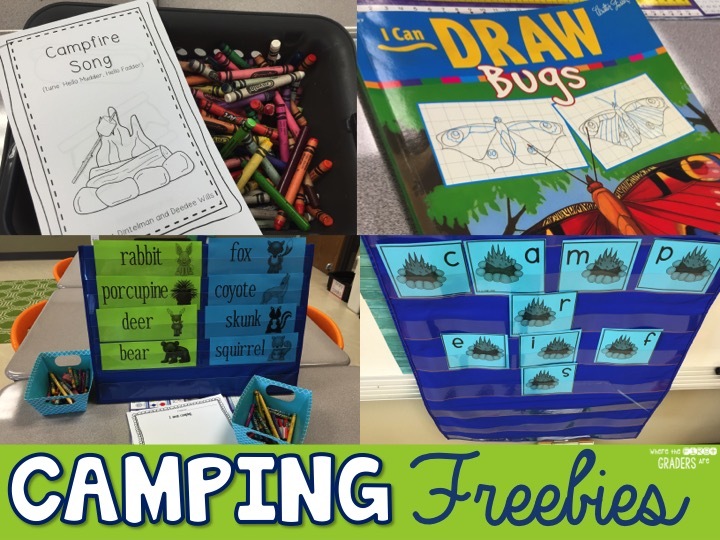 I made an example and set it up on an easel for the kids to use as a guide. Many of them made something similar to mine, but many took it in a whole new direction which was really neat to see! It really inspired their creative juices! I really thought this station might only be liked by the girls, but the boys absolutely loved it also! 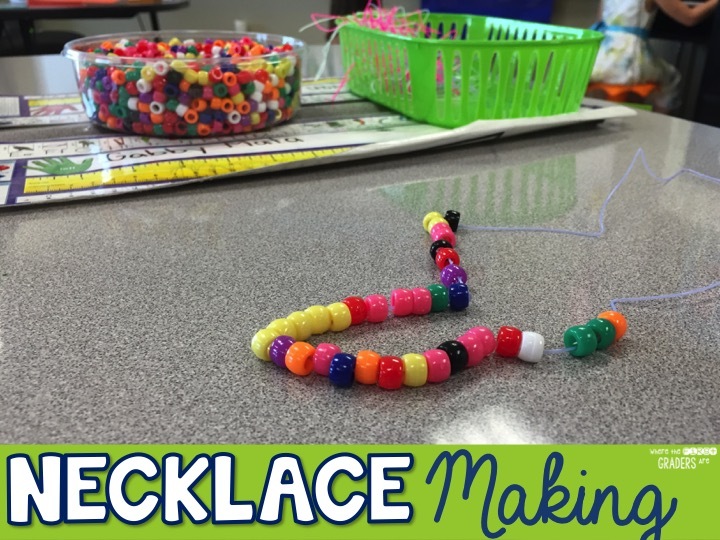 I bought a tub of 1,500 beads for around $5 and we had PLENTY left over after every student had visited this station twice. The best advice I can give you is to use the elastic string. I tried using embroidery string first and it was an absolutely NIGHTMARE! Do not use anything where the strands might come apart. It was really hard for the students to get beads on the string. The elastic string worked MUCH better! 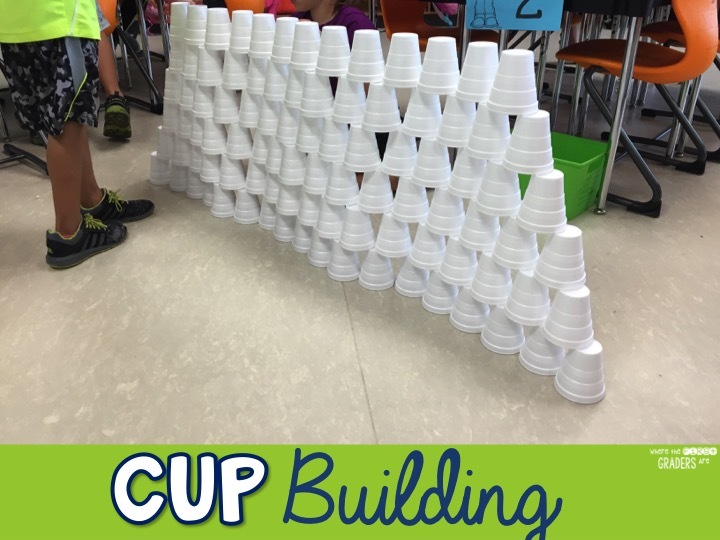 Cup building is always a favorite with my students. You can buy 100 styrofoam cups for less than $2. You can challenge them to see who can make the tallest, widest and most creative structures! 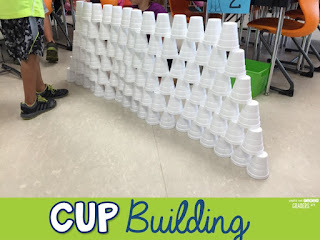 This station seems simple enough, but it actually takes a lot of skill and balance to try and get all 100 cups stacked on top of one another without them falling! I would even see students at other stations watching them and cheering on the cup builders! This is something that I do EVERY YEAR! 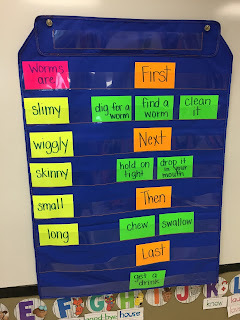 I always start out by showing them the paper with the title "How to Eat a Worm", then ask them "Who wants to eat a worm with me?". Every year, without fail, the students gag and say "eww", and one year I even had a student cry (poor thing). 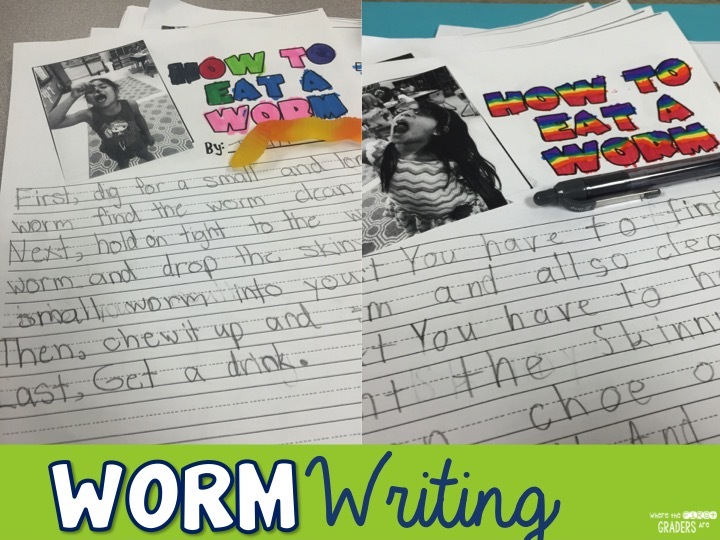 The first thing we do is brainstorm ideas together on what steps it would take for you to eat a worm. 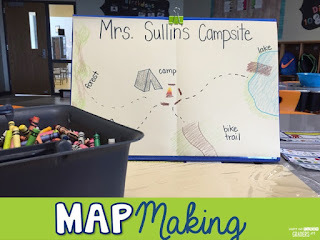 This year we used notecards and a pocket chart. 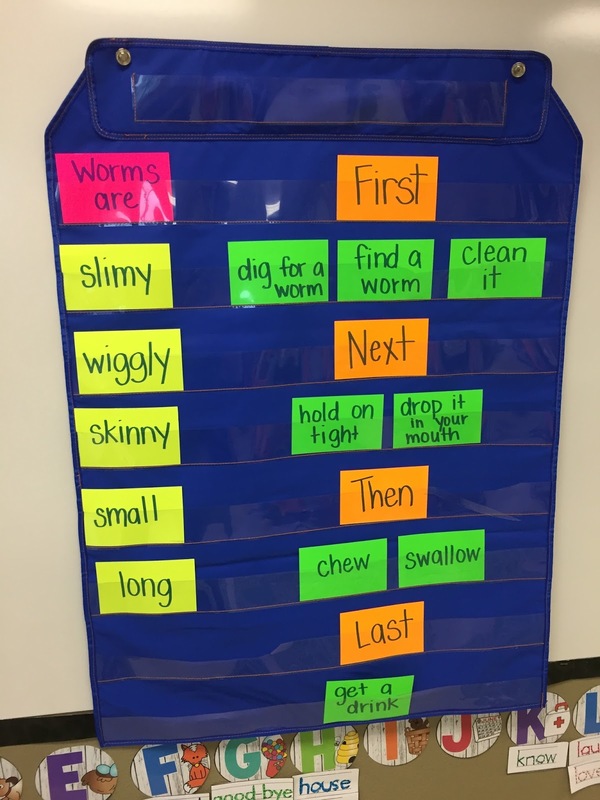 We also added some adjectives to describe a worm that we could use in our writing. Then, I have the students write out the steps on their own papers. As they finish, I read their writing and hand them a gummy worm to take their picture with. I print the pictures out on our black and white printer at school (I know, not as much fun as color, but WAY faster than having real photos developed). The students glue on their picture and enjoy their gummy worm treat! 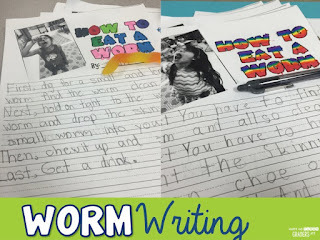 Get my "How to Eat a Worm" writing page FREE, simply sign up below!